Pioneer Tom Mboya Street is located in the busy downtown area of Nairobi. Facing it is the majestic Nairobi Fire Station. 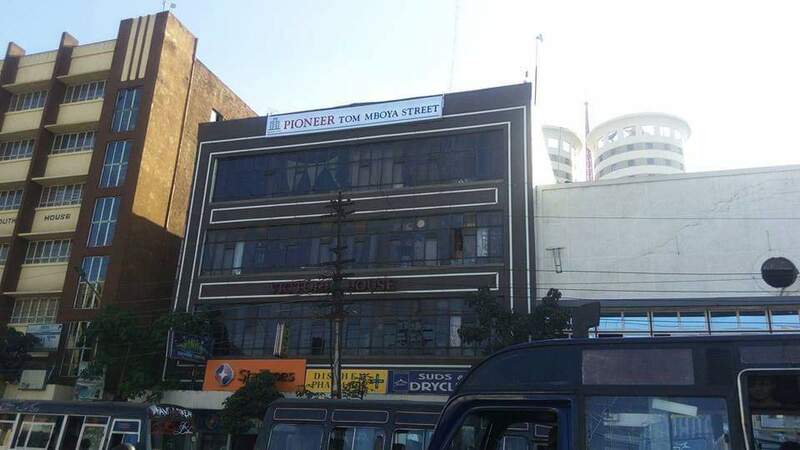 Pioneer Tom Mboya Street is a commercial development comprising of three floors. The ground floor has shops whereas the upper three floors have office spaces. The property contains spacious small, medium and large size shops and offices beginning at approximately 100 sq. ft. and above. There is sufficient parking along the building that is managed by the County Council of Nairobi. There are well-maintained modern toilets and bathrooms in the development. These facilities are shared. Common areas are served by a well lit a staircase. There is provision for office kitchen services and washrooms. Environmental management whereby the Landlord ensures that cleanliness and all green areas are up-to international standards have not been compromised. Security has been beefed up to ensure the residents are always secure. To ensure more security for its residents, hand-held scanners are used at the entrance. Security guards man the entrance and constantly patrol the along all the floors. Security equipment including fire alarm and security back-up alarms has been installed by a reputable organization.